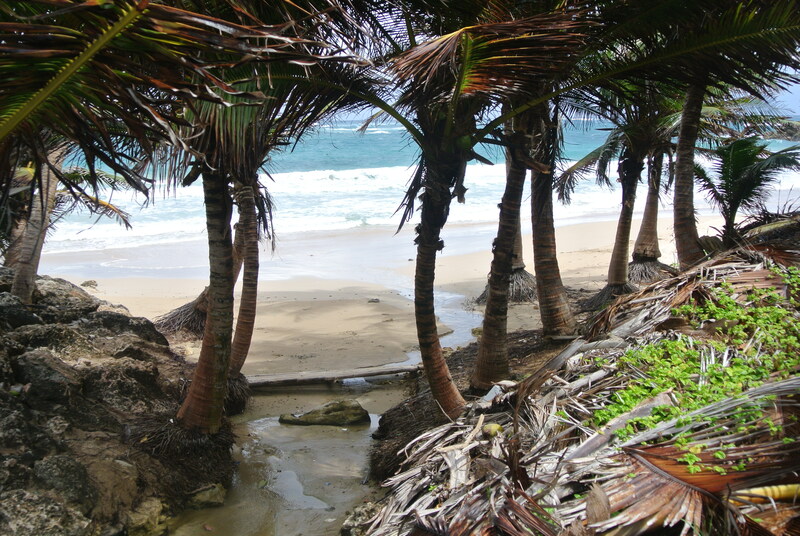 BARBADOS – The woman in high heels and flower-print dress is having trouble with the mud. She is trying to keep up with her friend in a slick black dress and smaller heels, who is ahead of her on he road. It catches the eye; two women walking on the side of the road through grass and mud near an unkempt field of sugarcane.The day is hot. As we pass them it appears they are not the only pilgrims. A hundred cars line the small two-lane road, making it difficult to drive. BMWs, jalopies, Hyundais, all sorts. We pull off to inquire. A fleshy white man (not that common a sight in the interior of an island whose citizens are mostly of African descent) explains that they are all going to an open house.In Barbados some of the old estate houses of the sugar plantations have been revived in recent years, and their owners are opening them for a day a year to locals or tourists.It is one of the many ways this fascinating island of “paradise” clichés pulls back its sandy, sunny exterior and shows its rich cultural heritage. Barbados is located in the lesser Antilles of the Caribbean, and is one of the southernmost islands. At 432 sq.km it is much smaller than Jamaica, but bigger than some of the smaller islands. Like many of the former British colonies it has a similar- sounding history. Ignored by the Spanish and ill-inhabited by indigenous people, it became a pirate haven and then a colonial fruit for the picking as the British began to challenge Spanish supremacy on the high seas in the late 16th century. But there was little by way of profit to be had on the island, so the colonists in the 17th century turned to sugar production. Sugar required labor and slaves were imported from Africa, part of the mass forced migration of black people to the Caribbean and Americas. Granted independence in 1966, today it is home to 277,000 people. My family and I have been visiting the island for the better part of a decade, getting to know its nooks and crannies. For most tourists the west side of the island is the destination. The capital, Bridgetown, is a warren of streets and shops, with a dignified parliament building. Most hotels are located along the coast southeast or north of this port. Because the western part of the island faces the Gulf of Mexico it has less surf and wind. It is also hot. Why anyone would opt for this area is unclear. Nevertheless, it is festooned with large hotels, most of them with the same boring beaches and mostly stocked full of Canadian and British tourists. Tourists can choose watersports or deep-sea fishing; there is even a submarine that takes people to view limited corals and sea life. For the adventurous the key is to escape the confines of tourist-dom and see the rest of the island. A large north-south highway aids access to some extent, but off of the this main route and the coastal road, the interior is full of unmarked roads and little villages. What is interesting is the degree to which many of the settlements still bear the geographic mark of the once-powerful sugar plantations. Throughout the island one comes across old mills, with estate houses next to them. Then across the street is often what was once called a “tennantry” or area where the former slaves lived. In the old days they built small movable wooden houses called “chattel houses.” Many of these little historical wooden dwellings still dot the landscape, and local photographers and artists have documented them. The population is concentrated in the environs of Bridgetown, Holetown and Speightstown on the West Coast and Oistins on the south coast. Oistins boasts a lively fish market and fish fry. The market seems to mostly consist of small flying fish, although Mahi Mahi and Marlin are also on offer. How fresh is the fish? The sellers claim it is fresh, but it doesn’t seem much is really being caught locally. If you venture behind the fish market there is a large dock and one can walk to the end of it where a local will often show you turtles in the water. Visitors can jump in and swim with them. A tip to whichever tout helped show you the place is appreciated. 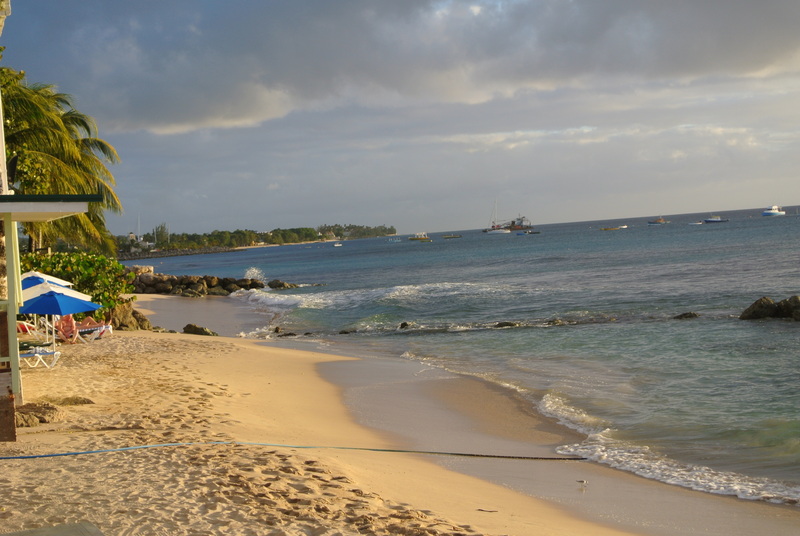 Holetown is to Barbados what The Village and Soho is to New York, on a very limited scale. Approaching the town one has to drive past the endless golfing property of Sandy Lane. They acquired the site in 1961 and established a sort of kingdom from the shore to the inland highway. Holetown itself has a new mall called Limegrove with the requisite over-priced shops. It is one of the few shopping venues on the island. There is a block of little restaurants that combine ethnic food with local flavor. IN THE 19th century a man named Sam Lord came up with a novel idea: Why be a pirate, with all the risks of having to outfit a crew, hire ugly men with long hair and fake an accent, when one could be a pirate from the safety of land? He would put out lanterns as if there was a harbor, and unsuspecting ships would wreck on the rocks near his house. Then he could legally plunder them under the law of the seas, which allowed people to “salvage” a ship that has sunk or was in distress. On the East coast Sam Lord’s “castle” lies abandoned today, although people did try to run it as a hotel. It is one of several spooky abandoned places on the island. At the very north of the island is another property, call the “old north point surf resort.” Here you will find a ghostly 50-meter pool. One wonders how properties like this fail in such an idyllic setting. One of the joys of traveling along the back roads is the plethora of tourist sites that can be discovered. For instance, dotted throughout the island are a series of watchtowers established by the British to alert the government to slave revolts and invasion. One is located near the zoo, and several others along the ridge that runs north-south. The soldiers placed antiquated binoculars in them so one tower could see the next and in that way messages could be relayed by flag signal. The old code-books are reproduced in one of the towers. Bored of history? For the kids, there is a zoo which boasts free-ranging monkeys and tortoises (officials ask you not to pick up the large, lumbering beasts). The monkeys, because they can easily leave the grounds, come in for daily feedings. There are several other displays, including one packed with iguana, and some miniature deer roam the property. Not far away are the Orchid World and Flower Forest and other botanical garden -style attractions. An elderly gent who styles himself a sort of English gardener in the grand tradition of “great gardening” runs a place called Hunte’s Gardens, easily located from signage on the roads and the ever-present maps. BAJAN cuisine is mostly a leftover from the colonial days, and a legacy of the sea. Flying fish sliders predominate. Callaloo and pumpkin soups are a favorite. The former, made with a green leafy vegetable, is a green broth, nice for a starter. Local Caribbean lobster is served in some places, as are shrimp. On weekends some local restaurants host buffets that produce “pudding and souse,” a hard-to-stomach combination of pig parts and lime. There is also macaroni and cheese and fried fish balls. Barbados produces a pepper sauce that is a combination of local peppers, vinegar and mustard that ranges from extremely hot to spicy. 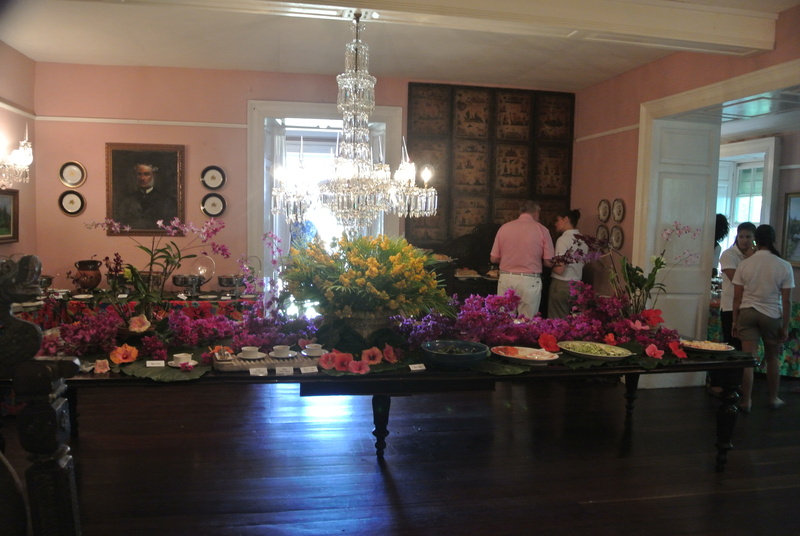 One of the best places to sample the flare is the Fisherpond house, a restored estate house that has a Thursday brunch. The well-groomed wait staff, which seems to consist entirely of high school students, invites guests to a garden for drinks (the requisite rum punch is a must). A large parrot sits in a cage nearby. This is followed by a four-course meal including soup, fish, meat and desert. 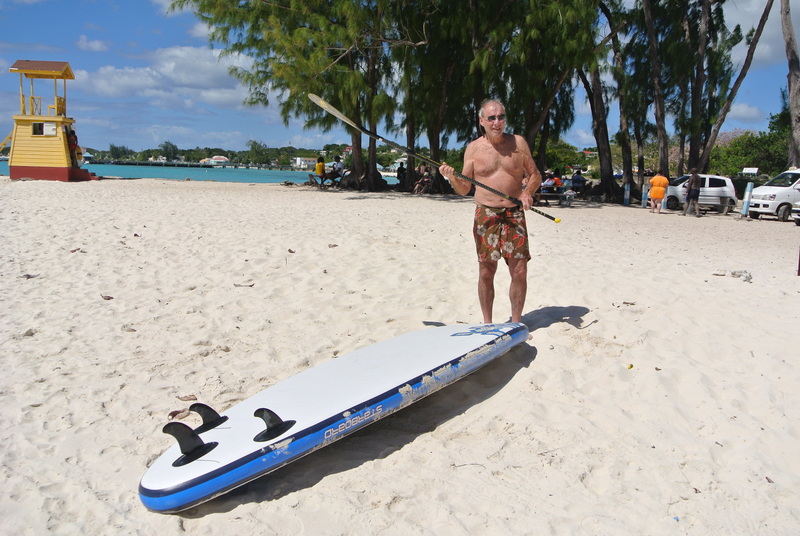 Like several Caribbean islands, Barbados has a rich and interesting Jewish history. Sephardi Jews fleeing the inquisition arrived in the islands from Brazil. In the 17th century numerous Jewish families lived in the main settlement of Bridgetown, mostly along two streets. They owned property and appeared to be prosperous in record books. Jews played a role in the sugar business and were an integral part of life on the island. However by the 20th century their numbers had drastically declined and the Sephardi community virtually disappeared, to be replaced by European Jewish immigrants. In recent years a concerted effort has been made to refurbish the synagogue and Jewish cemetery in Bridgetown and a new museum has been opened. This is well worth a visit. Like the rest of Barbados it provides another look into the diverse and fascinating history of this beautiful and welcoming island.